Fabric clouds room decor with adorable happy faces are a whimsical touch in any baby or kids space! Each Happy Cloud measures apx 14 x 12 and each letter is approx 6 diameter. These clouds are adorable on a blue wall! Price includes 5 letters with each design - additional letters are only $6.00 each. Each letter comes in a variety of pastel and primary colors including solid and check (gingham). Fabric letters are embroidered, filled with foam and backed with cotton fabric. 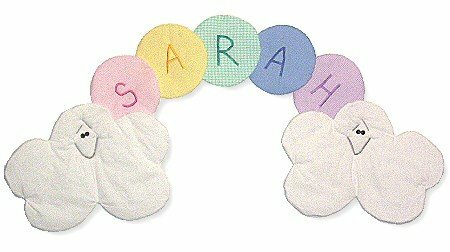 Letters are attached together and hooks are added for hanging on your child's wall or door. Each letter measures approximately 6" in diameter.